This page provides summaries of non-internet based workshops, seminars and conference sessions that PERN has helped to organize. This two-day workshop was organized with support from the Alliance Program of Columbia University and three French Universities: Sciences Po, Ecole Polytechnique, and Pantheon-Sorbonne. The workshop focused on modelling the potential migration associated with climate change at a variety of scales and using different data and methods. When discussing so-called “climate refugees”, the most frequently asked question by decision-makers and the media relates to the numbers of people who are likely to migrate owing to climate change impacts. Thus far the academic community has largely been silent, and estimates have been developed by a number of non-governmental organizations and interest groups, most of which are back-of-the-envelope estimates. Unfortunately, despite their shaky foundations, these numbers are often widely cited. While the difficulties of developing useful future estimates are non-trivial, there are some promising emerging approaches for the research and modelling community to pursue. There are also lessons to be learned from the quantitative climate modelling and climate-conflict communities. Therefore, goal of this workshop was to bring together the community interested in data and modelling related to population migration associated with climate variability and change. This will allow for a thorough comparison of methodologies and the delineation of a clear research agenda that would lead to more robust predictions and scenarios of people displaced by climate change impacts. This panel focuses on migration and population displacements associated with environmental change. The literature on so-called “environmental refugees” has exploded in the past two decades, but the actual evidence for environmentally induced population displacements is relatively slim. These papers will examine the evidence for past migration from environmental changes (such as land degradation), natural hazards (such as droughts and flooding), and large scale infrastructure projects with environmental consequences. The papers then go on to ask the question: Can we say with any certainty what future migration patterns will be given projected changes in climate and patterns of development and the likelihood that major infrastructure projects will be part of the mix of adaptation responses? This workshop is focused on urban population, development and environment (PDE) dynamics in developing countries. The selected papers represent policy-relevant papers that accurately present some aspect of the current PDE dynamics in a given urban agglomeration (i.e., case studies on specific cities based on original research), the findings of which can be applied to solving problems associated with rapid urbanization in contexts of high poverty and growing strains on the environment and natural resources, as well as to promote policies to achieve Millennium Development Goal 7 and its associated targets. de Sherbiniin, A., A. Rahman, A. Barbieri, J.C. Fotso, and Y. Zhu (eds.). 2009. 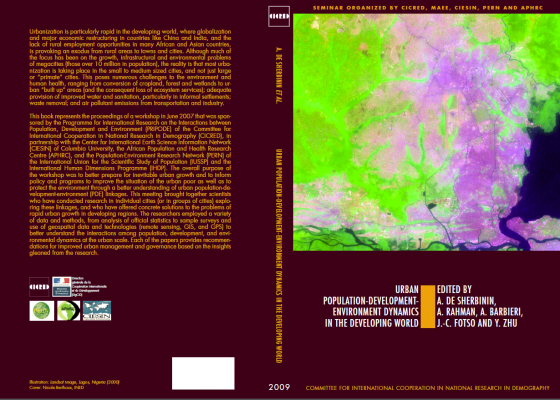 Urban Population-Environment Dynamics in the Developing World: Case Studies and Lessons Learned. Paris: Committee for International Cooperation in National Research in Demography (CICRED) (316 pages). Please click on the paper titles below to download the papers in PDF format. Urbanization is particularly rapid in the developing world, where major economic restructuring in countries like China, and the lack of rural employment opportunities in many African and Asian countries, is provoking an exodus from rural areas to towns and cities. Although much of the focus has been on the growth, infrastructural and environmental problems of megacities (those over 10 million in population), the reality is that much urbanization is projected to take place in the small to medium sized cities (e.g., former provincial towns), and not just large or “primate” cities. This poses numerous challenges the environment and health ranging from conversion of cropland, forest and wetlands to urban “built up” areas (and the consequent loss of ecosystem services); adequate provision of improved water and sanitation, particularly in informal settlements; waste removal; and air pollutant emissions from industry and transportation. The overall purpose of the meeting is to better understand urban population-development-environment linkages with the aim of informing policy and programmes to improve the situation of the urban poor as well as to protect the environment. This meeting will bring together scientists who have conducted research in individual cities (or perhaps comparative work on a number of cities) exploring these linkages. It will seek to extract from the studies recommendations for improved urban governance. Papers will be solutions-oriented, seeking to identify the leverage points and approaches necessary to meet the housing and service needs of growing populations while seeking greater urban environmental sustainability. Target audiences for the results will be urban managers (mayors, planners, city officials, and agency staff) and other researchers addressing these linkages. Sanchez-Rodriguez, Roberto, Karen C. Seto, David Simon, William Solecki, Frauke Kraas, Gregor Laumann. 2005. Science Plan: Urbanization and Global Environmental Change. Bonn, Germany: IHDP. Tannerfeldt, Göran and Per Ljung. 2006. More Urban, Less Poor. London: Earthscan. This invited session at the IUSSP International Population Conference examined a number of different aspects of population-enviornment linkages. 3. Integrating projections of households, energy use and carbon emissions for the United States • Michael Dalton, California State University, Monterey Bay; Brian C. O'Neill, International Institute for Applied Systems Analysis (IIASA); Leiwen Jiang, Brown University; John Pitkin, Analysis and Forecasting, Inc. This workshop was organized by PERN with funding from MacArthur Foundation's Population, Consumption and Environment (PCE) initiative. The purpose of this workshop was to explore a research agenda and methodological approaches for studying the linkages between population, consumption and environment in both developed and developing countries. It built upon earlier research agendas set by the National Research Council's Environmentally Significant Consumption: Research Directions (Stern et al. 1997), and the Organization for Economic Cooperation and Development's (OECD) sustainable consumption initiative (OECD 2002). The agenda was as follows; papers that are linked are available for download. Click here for a workshop summary. Organization for Economic Cooperation and Development (OECD). 2002. Towards Sustainable Household Consumption? Trends and Policies in OECD Countries. Paris: OECD.